Download, play, rule them all. Based on the AlternateHistory.com story by Drew. John Julian McKeithen, a former governor of Louisiana, decides to stand for the Democratic nomination. He’s a more moderate figure than George McGovern and can appeal to a wider audience, and crucially also comes from a political background that has acquainted him quite as much with dirty tricks as Nixon. Theoretically, thanks to McGovern refusing to step down and standing as a “Peace” candidate, as well as George Wallace staying in the race, no one wins the Electoral College vote. I, however, haven’t been able to get such a result. Nevertheless, I’m releasing it now and am open to suggestions for refining it. UPDATE 2/4/19: Reinstated the Crystal Ball. I had no idea that Barry Commoner was in fact a real independent candidate in 1980! Oops! This is an updated and tweaked version of VCCzar’s 2020 Presidential Election.All the credit for the basis of which this version is based upon goes to him. The region polls are tweaked to fit current data and Howard Schultz is added as an Independent candidate. Additionally, most of the news articles are removed (I don’t want to predict the future) and more candidates are added to the Libertarian Party as well as AOC being included as an endorser. Some candidates (like Zuckerberg and the Rock as well as the numerous GOP candidates) have been removed for the sake of realism and I will add and subtract candidates as the race further develops. The Democratic primary starts out with Biden carrying a thin lead in most states but this will typically diminish as candidates gain strength in their own areas. The Republican primary obviously favors Trump with Kasich as “undecided’. Updated Libertarian candidates: Includes Justin Amash, Bill Weld (off), and more. Endorsers are up to date and stats are more reflective of current events. Some of the positions are fixed and some of the more “biased” bios are changed. Update: Yang added and some other polling numbers tweaked. 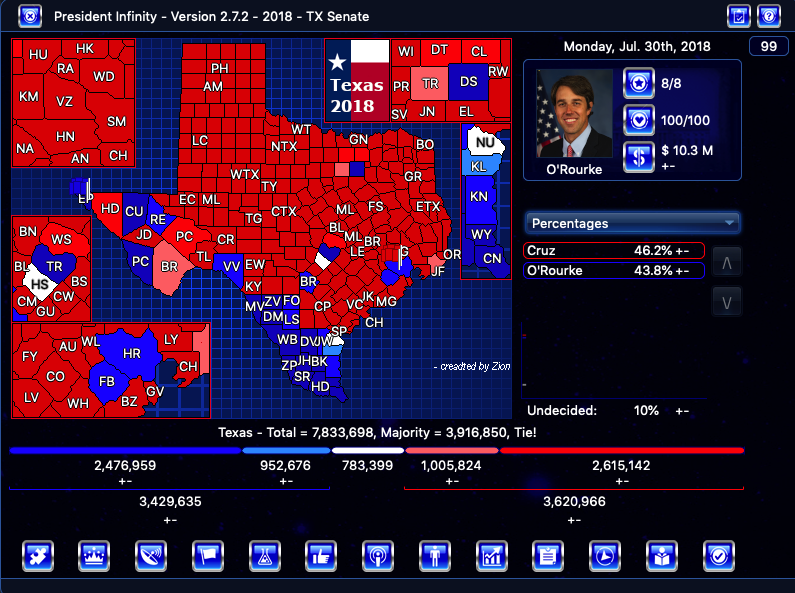 It’s still in some development, but mostly it should be done, I’m really bad at balancing, so please tell me if there’s any issues of one party winning every time. Also this is my first publicly posted mod! 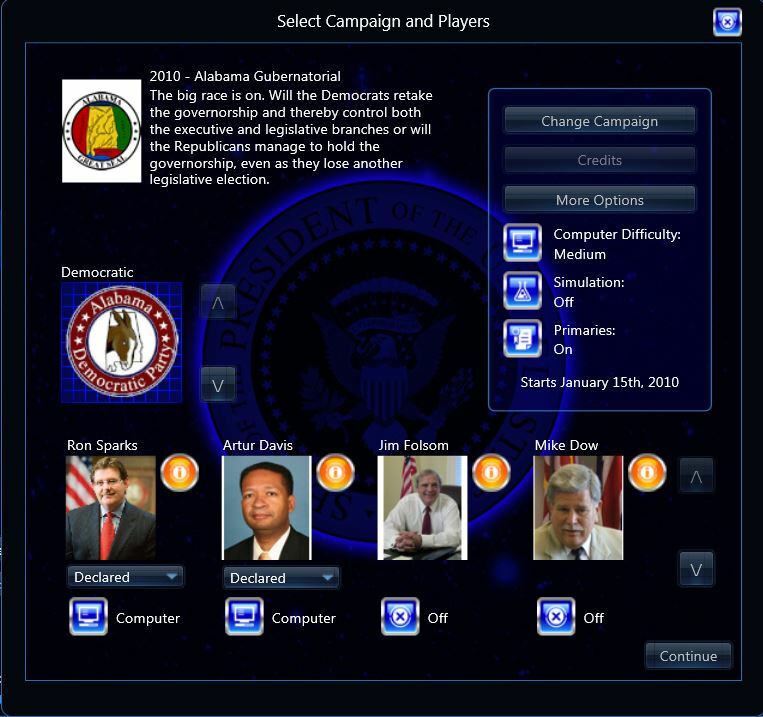 This campaign is loosely based off an existing “Brazil – 2018” scenario by victorraiders, but focused on the second round instead of the first round. I am planning to add more endorsers and possibly more events and possible running mates. I’m looking forward to seeing any feedback. Have fun! I have completed a remake of the old 2010 – Alabama Gubernatorial Election scenario from the old P4E2008 game. Polling for candidates who ran are set to the official results. The what ifs from the old scenario keep the P4E2008 polling data which seems to produce a nice blend. For some of the weaker official candidates I tried to find issue specific issue positions but where it wasn’t possible they are defaulted to the old scenario GOP platform. There are a lot of endorsers so they best function with primaries enabled to avoid a huge momentum surge. Here is my version of the upcoming West Virginia 2020 Gubernatorial Election. I will be adding events and more endorsers. Hope you all enjoy and please leave some feedback! In January 2017, President Donald Trump tapped Alabama Senator Jeff Sessions to be the next United States Attorney General. Will the GOP hold on to his seat in this deeply Republican state, or will former District Attorney Doug Jones become the first Democrat to represent Alabama in the Senate in over 20 years? 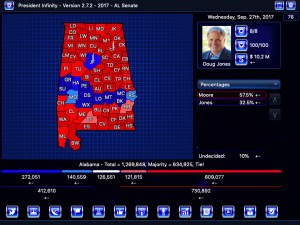 Candidates include Democrat Doug Jones and Republicans Roy Moore, Luther Strange, and Mo Brooks. I might add the GOP primary later if this generates enough interest. Let me know what you guys think! 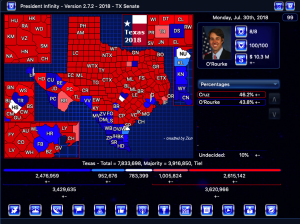 Description: Former presidential contender and incumbent Senator Ted Cruz is running for reelection to a second term. He is opposed by Congressman Beto O’Rourke, who is widely seen as a rising star within the Democratic Party. Will Ted Cruz hold on to his seat, or will the much anticipated “blue wave” pull the young congressman across the finish line? 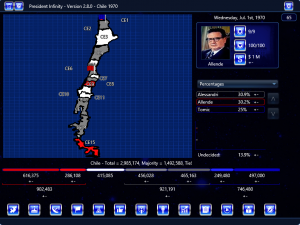 In 1970 the Chilean situation is not good. With an economy in the midst of recession, the Chilean people look for someone who can lead to a brighter tomorrow. Of course, foreign and business interests have other things in mind. In this three horse election, the fight is between Marxist Salvador Allende, Rightist Jorge Alessandri, and Christian Democrat Radomiro Tomic. 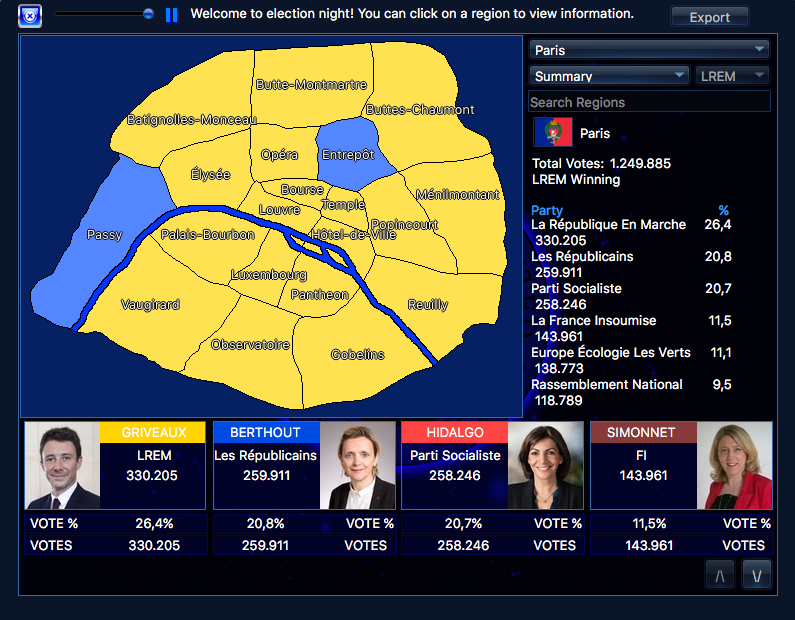 I present you the 2020 Paris Mayoral Race. With the principal parties participating, the LREM (La Republique en Marche), Les Republicains, Parti Socialiste, La France Insoumise, Les Verts, and Rassemblement National.